Front row (left to right): 1. Mike Ingles, 2. Terry Kahn, 3. John deTreville, 4. John Shoemaker, 5. unidentified, 6. Joey Soto?, 7. George Ising, 8. George Donaldson or Chuck Varney?, 9. Laverne Caldeira. Second row: 1. unidentified, 2. unidentified, 3. Priscilla Martinez, 4. Cathy Witbeck, 5. unidentified, 6. Judy Dodds, 7. Charlotte Pearce, 8. Catherine Gunn, 9. Penny Cleek, 10. unidentified. Third row: 1. Mrs Fannuchi, 2. Carmel?, 3. Francis Caton, 4. Dianne ?, 5. Gail Emirick, 6. Joyce Fields, 7. Kathleen Jones, 8. Sandra Baird, 9. Joanne Myers, 10. Carolyn Conkel, 11. Maureen Mackay. Fourth row: 1. unidentified, 2. unidentified, 3. Bill? or Cecil?, 4. Kenneth Rettig, 5. Pete Szekely, 6. Merle (Buddy) Housh or House. Credits: Scanned and submitted by John deTreville. 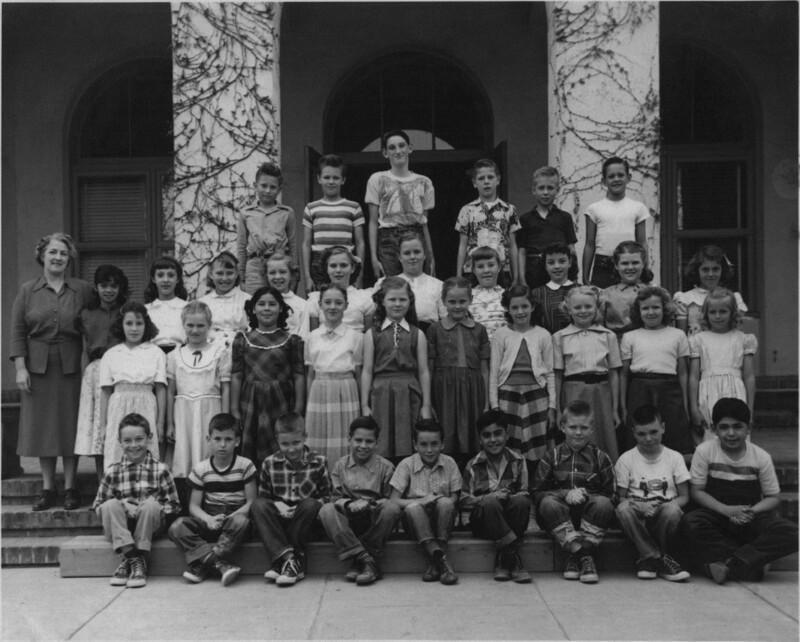 Thanks to John deTreville, Tony Favero, Lynn (Erickson) Murray, Esther (Cleek) Rupley, Bill Rundstrom, and Pete Szekely for identifying the kids in this picture.